Many people are looking for natural herbs to vaporize or smoke that can help them relax and get into a creative space, cut down on smoking, or just enjoy a healthier cigarette. Maybe you have smoked tobacco or ganja for a long time and are looking for something to mix or replace it with, maybe you are looking for a nice smooth herbal cigarette with no chemicals, maybe you are interested in natural highs and herbs to smoke that will expand your consciousness, or you suffer from stress or anxiety and are looking for a balanced, healthy way to address that. Whatever the reason, there are many herbs out there that are really pleasant and enjoyable to vaporize or smoke. Damiana ~ Smooth, Relaxing and Consciousness opening. I would say this is one the best herbs to vaporize or smoke and to base your herbal vape blend on, considering its flavour and effects! Damiana was used in herbal medicine (in extract or tea form) as an aphrodisiac, an antidepressant, a nervous system tonic and for PMS relief. Passionflower ~ Interacts synergistically with Damiana and is great in a relaxing vape or smoke blend. Used in herbal medicine for insomnia, anxiety, and as a nervous system tonic. 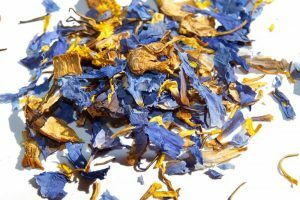 Blue Lotus ~ An Egyptian euphoric that blends well with Damiana and other herbs. 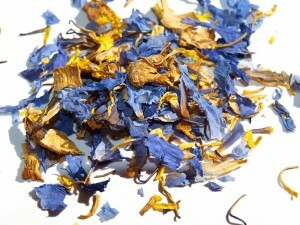 Vaporizing Blue Lotus on its own is a little dry so I suggest a combo with Damiana, Passionflower and/or Wild Dagga. Pink Lotus Stamens ~ Smooth smoking, grounding, and peaceful. Nice enough to vape/smoke alone but more effective combined with Damiana. Mullein ~ Mullein is a good base for your herbal vaporizer blend. It cleanses the lungs and adds to the body of the mix. Mullein does not have psychotropic effects. Bearberry/Uva Ursi ~ Often added into the sacred peace pipe at Native American Ceremonies. A nice earthy taste with mild relaxing effects. Best used as an addition. Wild Dagga ~ Considered an empathogen which means it enhances the effects of other herbs. 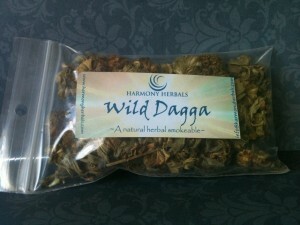 Wild Dagga can be combined with your other favorites to up their potency! A vasodilator which enhances delivery of herbs into the bloodstream. Sage ~ Sage is beautiful for adding a nice flavour twist to your smoking blends. Clears energy and is often used in ceremony. Red Raspberry ~ Red raspberry leaves are another herb used by the Native Americans in their “Kinnikinnick”, or natural smoking blends. Nice in the base of a mixture to add body. Try blending with Damiana and Uva Ursi! Calea ~ Also called Dream Herb, Calea was used by the Chontal Indians in Mexico for divination. It is a mild sedative and is thought to encourage lucid dreaming. * Chamomile: 100°C to 125°C (212°F to 257°F) ~ Main Properties: Anti-inflammatory, antispasmodic, relaxant, carminative, bitter, nervine. * Lavender: 100°C to 125°C (212°F to 257°F) ~ Main Properties: Carminative, relieves muscle spasms, antidepressant, antiseptic and antibacterial, stimulates blood flow. * Passionflower: 100°C to 150°C (212°F to 302°F) ~ Main Properties: Anti-inflammatory, antispasmodic, hypotensive sedative, tranquilizing. * Peppermint: 100°C to 150°C (212°F to 302°F) ~ Main Properties: Carminative, relieves muscle spasms, increases sweating, antiseptic. * Sage: 125°C to 150°C (257°F to 302°F) ~ Main Properties: Astringent, antiseptic, aromatic, carminative, estrogenic, reduces sweating, tonic. * Thyme: 100°C to 150°C (212°F to 302°F) ~ Main Properties: Antiseptic, tonic, relieves muscle spasm, expectorant. * Anise: 150°C to 175°C (302°F to 347°F) ~ Pharmacologic action: carminative, antispasmodic, expectorant, a pancreatic stimulant. 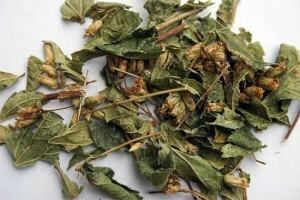 * Damiana: 150°C to 175°C (302°F to 347°F) ~ Main Properties: Nerve tonic, antidepressant, urinary antiseptic. * Feverfew: 125°C to 175°C (257°F to 347°F) ~ Should be taken regularly to receive maximum benefit and protection from migraines. The leaves and flowering heads are antiinflammatory, antispasmodic, aperient, bitter, carminative, emmenagogue, sedative, stimulant, stomachic, vasodilator and vermifuge. * Ginkgo: 125°C to 175°C (257°F to 347°F) ~ Helpful in the treatment of allergies, Alzheimer’s disease, anxiety attacks, arthritis, ADD, circulatory disorders, cancer, coughs, depression, dizziness, equilibrium problems, headaches, heart & lung problems, memory loss, mood swings, muscular degeneration, tinnitus, toxic shock syndrome, varicose veins, vascular impotence & vertigo. * Kratom: 175°C to 200°C (347°F to 392°F) ~ CAUTION: This can be an addictive substance. Has a yohimbe-like stimulant activity, and uncaria-like immunostimulant activity. Kratom is said to produce a sense of well-being, with users reporting anti-depressant, anti-anxiety, analgesic, and even euphorigenic effects. It is paradoxically a stimulant and depressant, used to aid work and also able to contribute to rest and sleep. Kratom’s psychoactive effects are reported to be relatively short-lived, typically fading after a few hours. * Marshmallow: 150°C to 200°C (302°F to 392°F) ~ Used in the treatment of dysentery, lung ailments and urinary ailments. The tea is also taken for gastritis and enteritis or used as an enema for intestinal inflammations, and is an excellent laxative for young children. For me my work with these herbs began when I quit smoking. I enjoyed the act of smoking, but I felt unhealthy and addicted. But I missed the preparation of the herbs, the rolling, the meditative experience of smoking, and the stimulation or peace I would experience. I’m a herbalist and I’ve always been into natural alternatives, so I began to research and look for ways that I could still include the parts of smoking I loved into my life, without the ill-effects. 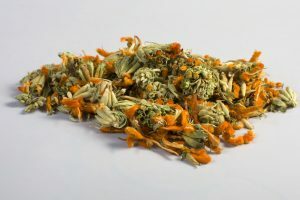 When I found Damiana, a natural smokeable herb from Mexico, I felt like I had hit the jackpot. I knew from herbal medicine that Damiana was used as an aphrodisiac, a nervous system tonic, a natural antidepressant and even as a flavouring in liqueurs and candies. What I didn’t know was that it is a smooth, delicious herb to smoke, it burns extremely well, and it comes with a relaxing natural high that could be compared to herbs like cannabis. It is stress relieving and makes you feel more connected to yourself, others and your environment. In a vaporizer, Damiana is magic. It is flavourful, healthy, and mixes really well. I now use Damiana as a base for all my herbal smoking mixtures. Thanks for visiting! 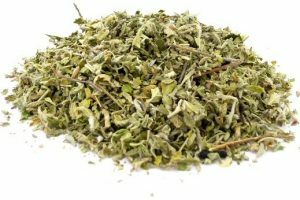 Don’t forget to visit my website at www.harmonyherbals.com to learn more about entheogens, great herbs to smoke, and more. 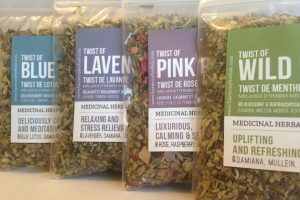 You can shop online here for ingredients to make your own natural herbal smoking blend! Enjoy and have fun. ← Musings on Candida: The Anti-Candida diet, Anti-Candida Recipes and more.